← Bill Gibson – Complex Selling Is About Getting To The Right People. Every Sale Is A Negotiation! Many years ago I was a top producing local radio advertising salesperson in the Twin Cities market of Halifax and Dartmouth, Nova Scotia, Canada. On the East Coast of Canada the harsh winters literally crippled automobile sales. In December, January and February it is not uncommon to have sub-zero temperatures and three snow storms in a month that range from a half metre to a metre and a half of snow. One early November day I called on John Gwynne-Timothy, the new owner of a small car dealership called Twin Cities Plymouth Chrysler. He told me that it did not make good sense to advertise in November, December or January because of the ferocious winters. Chrysler Canada had instructed him to put aside C$100 000 for each of the three winter months, strictly for losses. He was also told to cut back on advertising and save the money for peak season. I could understand their thinking – first you have to find the car under the snow before you can show it that time of year. My response to John was that with everyadversity there is an opportunity and the best time to gain market share is in a down economy. I added that most of the competitive dealerships would also be cutting back on advertising and the buying of inventory during that period. The advertising noise level in the market place was far less in the winter months. This would make it easier to dominate the market with less spending. The other dealers also were not buying cars at the auctions and it would be the best time to buy. • He went to the automobile auctions and bought at low, low prices. (If you buy right, you can sell right). • On Friday afternoons at 4 pm we cleaned out his huge service department and decorated it with colourful streamers, balloons and so on. • We then brought into the service department many of the especially low-price used cars and new ones. • On the Friday morning we hit with newspaper and radio advertising – all day Friday and all day Saturday. In the weekly and monthly magazines we advertised the Winter Sale Bonanza Friday and Saturday at Twin Cities Plymouth Chrysler. • We had live onsite radio announcers and upbeat music playing in the service department on the weekends and we sold cars until 9 pm on Friday and Saturday. The final result was that Gwynne- Timothy profited C$100 000 per month in December, January and February. He budgeted for a C$300 000 loss and instead made C$300 000. In actuality, he was C$600 000 ahead. In February, the competition eventually tried to counter attack – after laughing at him for what they thought was a waste of advertising money in December and January – but it was too late. He already had momentum. This momentum carried over to peak months from March to October with astronomical sales. He had gained huge market share in the down months that positively impacted the best months. Within a year Gwynne-Timothy sold his small dealership for a huge profit and bought the largest Ford dealership in Atlantic Canada. Today he is a multimillionaire, simply by being innovative and proactive in a down economy – in Canada during the winter months. The following graph shows that 20% of a smaller market can be larger than 10% of a big market. 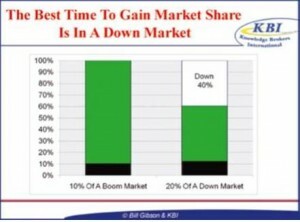 It is easier to gain market share in a down economy. A few years later, as a consultant in Canada, I had another client named Terry Straker. At the top of the economy he was grossing C$200 000 a month with his bedding and bedroom furniture stores in Calgary, Alberta. The country went into a recession and competition got stiffer. Eighteen months later, at the bottom of the economy, Terry grossed over C$1 million in one month – a 400% increase. How did he do it? He got innovative and aggressive. He knew cash was king so he negotiated hard when buying. He then increased his advertising in the right mediums that targeted his market. Through research he knew the best days and best weeks to advertise. He increased sales training to twice a week. He tied in with charities and ran innovative promotions. Straker once ran a promotion called Mr Money, where he dressed his brother up in a Mr Money outfit, and on Friday he announced to the media that Mr Money was dropping C$5 000 from the roof of his biggest store on Saturday. The plan was to drop C$500 an hour in small bills for 10 hours. Ten thousand people showed up and he got massive publicity. He had the biggest day ever. The reason is that in a down economy people want money. He used endless creative traffic building ideas. Among them was a promotion with Salvatore (Sal) Stallone, Sylvester Stallone’s brother. Rocky II had just opened in the theatres. 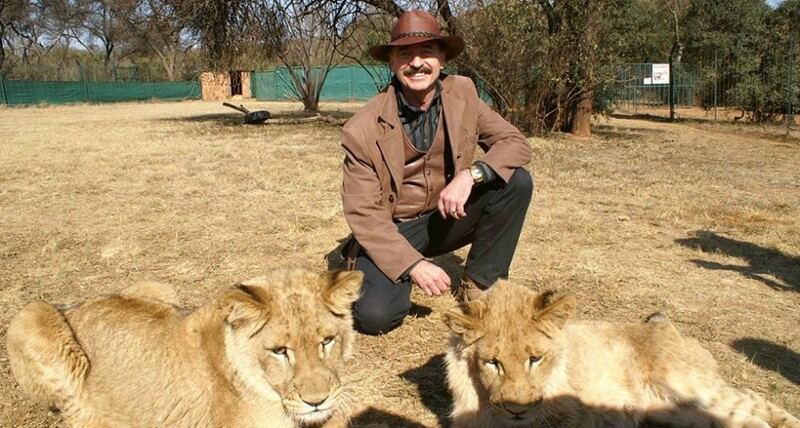 Even though the economy was down, Terry increased his sales by 400%. The solution is to believe you can gain market share in a tough economy if you take control of your own economy and get creative, innovative and pro-active. Do not wait for others or external factors to do it for you. Take control. This entry was posted in Economic & Community Development, Entrepreneurship & Business Ownership, Management & Leadership, Sales & Key Account Management. Bookmark the permalink.